On August 25, 2015 a massive protest was organized by the Patidar Anamat Andolan Samiti (PAAS) formed recently in July this year. 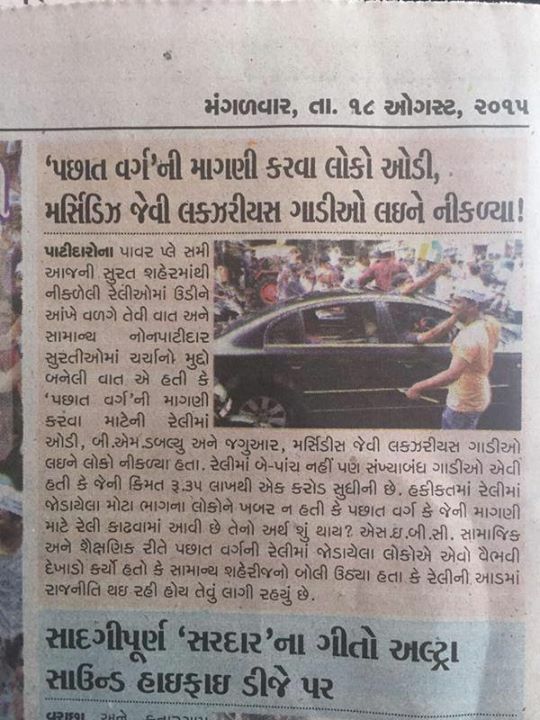 Ironically these protests demanding the Patidars(Patels) to be included in the Other backward Class (OBC) category, are attended by protesters in Mercedes, Audi and other such luxurious cars, local Gujarati media reports. Although the day progressed peacefully it took a violent turn after the brief detention of the leader Hardik Patel. “Police first switched off all the lights at GMDC ground and then took Hardik somewhere. Before that police lathicharged and even beat up women and small children,” Hardik Patel’s aide and spokesperson of the Patidar Anamat Andolan Samiti Chirag Patel alleged. “Vastrapur police station’s inspector M M Shaikh today went to the GMDC ground and detained Hardik Patel as he sat on dharna (and hunger strike) without taking police permission,” police station officer Pravin Solanki said to Indian Express. It’s unlikely that the 22-year-old alone could have mobilized 5 lakh people at the GMDC Ground. Equally interesting was the way the event was managed — from getting parking for thousands of vehicles to obtaining permissions and mobilizing funds. Many believe bigger forces are at work. Soon after Hardik’s arrest the protest took a vicious turn and the city was gripped by violent incidents. Various occurrences were reported from Surat, Mehsana, Baroda, Patan, Viramgam, Morbi, Amreli, Rajkot, Modasa, Palanpur and other places as well. Highways were blocked, vehicles, busses torched, shopping malls damaged, a railway crossing was destroyed and tracks uprooted near Kapadvanj. Eight people, including a policeman, have died in the violence that ensued. Shockingly, many incidents were reported where the police went into peoples’ houses destroyed furniture, damaged cars and property and even beat up women in their houses. The Gujarat High Court has ordered a probe into the alleged excess use of police force. The court has sent a notice to city’s Police Commissioner Shivanand Jha and asked him to furnish details of the police action within two weeks. 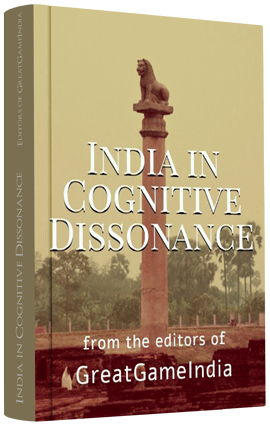 What is to be noted here is that instances of police brutality and violence were reported from more than one areas in Ahmedabad and even from different cities. The way in which the protesters at the GMDC grounds were raided at night resulting in the chaos and increased violence, police involvement in the violence and Hardik Patel’s proximity with International Working President of the Vishva Hindu Parishad (VHP) Pravin Togadiya have led many experts to raise some serious questions and draw parallels to the 2002 Riots. Although this agitation was claimed to be a Patidar(Patel) protest four top Patidar organizations have officially said they are not linked to this reservation agitation. Four major organization of Patidar(Patel) community namely Khodaldham Sanasthan Kagvad, Shri Umiya Mataji Sanasthan Unjha, Shri Samast Patidar Samaj Surat and Shri Umiya Mataji Sansthan Sidsar have in a joint statement clearly stated that they have no connection to the ongoing Patidar Anamat Andolan, an agitation seeking reservation in government jobs and colleges for Patels as reported by DeshGujarat. If the Patidar Anamat Andolan Samiti (PAAS) formed recently in July this year do not have major Patidar organizations support and are not linked to them then why would they protest in the name of Patidars? We started in 2012 providing protection to the community… later we found that the reason behind all those problems was reservation not given to Patels. During the last 10 years many farmers who have committed suicides in Gujarat were all Patels; and the reason for the suicides being reservation not given to Patels. During the last 10 years the problems being faced by Class 3, Class 2 and Class 1 officers were all because of reservation not given to Patels. Patel were facing many problems in Gujarat and were not able to progress because of not getting reservation hence they migrated to foreign countries. Now there is no way to substantiate these bold claims unless Mr. Hardik provides conclusive data. What is interesting to note here is the linkage Mr. Hardik is trying to make between farmer suicides and reservation. Hardik has now alleged that if ex-gratia isn’t given to the victims of the violence, farmers will be asked to stop supplying basic commodities. ”If ex-gratia isn’t given to victims, we will ask farmers to stop supplying milk, vegetables, water etc.,” Patel told ANI. The country has seen over a quarter of a million farmers’ suicides between 1995 and 2010. The National Crime Records Bureau’s latest report on ‘Accidental Deaths & Suicides in India’ places the number for 2010 at 15,964. That brings the cumulative 16-year total from 1995 — when the NCRB started recording farm suicide data — to 2,56,913, the worst-ever recorded wave of suicides of this kind in human history. Whether all these farmers suicides were a result of denial of reservation and is reservation the solution to this problem only Hardik could explain better. However he is not the only one to make such claims. Recently, Union Agriculture Minister Radha Mohan Singh in a bizarre comment in Rajya Sabha attributed the reason for these farmers’ suicide to dowry, love affairs and impotency. On the other side demanding compensation against 700 acre of their lands which got submerged after construction of Gokul Barrage without their consent, the farmers from 11 villages of the district had been agitating since 1998 when the gates of the barrage were shut on the pretext of a test being undertaken and their land went under the water. Although the entire Patidar Anamat Andolan Samiti (PAAS) movement is about reservation for the Patidars(Patels) as proclaimed by them it underlines certain serious issues related to agriculture and other development related policies. All these fundamental questions raised above that form the basis of the entire movement need to be answered first before creating a mountain out of a molehill. Unfortunately, the entire debate seems to be spiraling off course from the real issues which nobody seems to asking. For a better understanding of what really ails our farmers and the factors impacting agriculture in India we request our readers to go through our analysis published in the July-Sept issue of GreatGameIndia magazine – Agricultural Terrorism – An Overview. Join the GreatGameIndia Forum for debates and discussions related to geopolitics and international affairs from an Indian perspective.